I listened to a speech by President of the European Parliament, Martin Schulz, in Berlin this morning at the Soul for Europe conference. 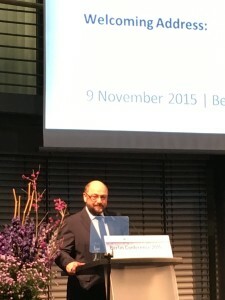 It was typical Schulz, full of bottled up indignation and frustration, railing at national solutions to transnational problems, and how challenges like climate change and the refugee crisis need EU-wide solutions rather than the return to the nation state that, according to Schulz, is incapable of stepping up to the challenge. The thing is that Schulz is President of the European Parliament. Not President of the EU. There’s an important difference between the two. And it is especially important as Schulz keeps leaking the idea that he wants to keep on as President of the European Parliament beyond 2017, and that Juncker apparently approves. In other words keep the de-facto große Koalition in the EU – with the EPP guy (Juncker) in the Commission hotseat, and the S&D one (Schulz) in the EP. The thing is that the European Parliament could do with someone as its figurehead who challenges the Commission, and defends the European Parliament, not someone – as Schulz currently is doing – who willingly complies with it. The thing is that Schulz knows full well how to defend his house, because he did precisely that from January 2012 until the European Parliament elections in 2014, trying to position the European Parliament as the voice of EU citizens against the other EU institutions, and prioritising the Spitzenkandidat process in the run up to the 2014 EP elections. Yet now what we have is the loser – Schulz – in cohoots with the winner of that process, Juncker. When it comes to issues like net neutrality, rejecting a committee of enquiry into Volkswagen, and even TTIP (where the line from Schulz today and his party comrade Gabriel are indistinguishable), we get the same, stodgy, centrist, big-business-friendly pro-Europeanism. “I was given 3.5 million signatures against TTIP,” said Schulz today in Berlin. “But do these people expect the United States to do a trade deal with indivdual small countries?” he continued. No, Schulz, that is not the point – if the European Parliament kicked up enough of a fuss you it could make TTIP more transparent to increase public trust in it. I am not expecting you to be against TTIP, but it is a reasonable expectation that the European Parliament could make a demand for better transparency, actually being popular among millions of Europeans concerned by TTIP, but you make no mention of that. So sorry Schulz, enough is enough. No permanent presidency of the European Parliament for you, or indeed anyone else for that matter. I am not that bothered who would come afterwards, but it needs to be someone who defends the interests of the European Parliament as the voice of EU citizens. Schulz is not doing that any more, so must stop.